On behalf of the Association Luisa Piccarreta Little Children of The Divine Will, I would like to extend my best wishes for the upcoming Easter celebrations to all of you. It is nice to think that in the Divine Will everything is possible and then I unite my poor arms to those of Jesus, in one embrace to all of you and I hope this Easter Sunday doesn’t pass like many others, but it sees us as risen in Christ to be adorned with that incomparable Light. Let’s offer all our sufferings, let us place at Jesus’ martyred feet our anxieties remembering that God does not suffer from anxiety because He has all eternity at his disposal. 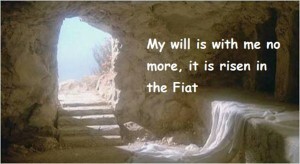 Let’ s give to Jesus all that makes us unhappy, so we will contribute to renew in Him the joy of his Resurrection. We are not fully aware of what living in the Divine Will means but day after day we can understand that we can own a great treasure, a power that no human creature can give us: “To live on earth as in heaven “. This is a foretaste of heaven. I wish you all to conquer this valuable pearl. the work is more of God than ours. live in It, and you can be sure that you will make yourself a saint. You will feel the bond and the association with the Divine Family. embalmed by Its love and joy. so that you may be like Him. let the Divine Will rise again in you. that the earth may no longer be earth for you, but Heaven.